AMC has exactly zero plans on ending The Walking Dead anytime soon. The network has seen ratings for their biggest show decline in recent years, but it's still a monster hit that stands above just about anything else on cable TV. As such, it shouldn't come as a surprise that the head of AMC has plans to keep The Walking Dead universe alive for another decade or more. Network CEO Josh Sapan spoke recently at the Goldman Sachs Communacopia Conference and, as one might expect, the subject of The Walking Dead came up. Citing the spin-off Fear the Walking Dead as an example of how the universe can expand and continue, Sapan seems confident that they can keep the franchise going for years to come, while maintaining respect for the fans and world they've set up. Here's what he had to say. "The Walking Dead is a universe...and we have a plan to manage over the next decade, plus. That plan is a careful plan to respect the world of the fans of that world." 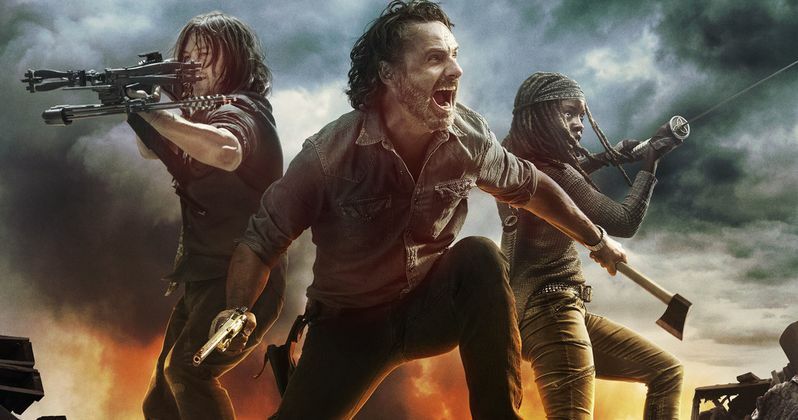 The Walking Dead season 9 will see some major changes for the flagship series. Andrew Lincoln is set to depart as Rick Grimes, who has been the show's lead since the very first episode. Lauren Cohan is also going to be leaving as Maggie, as she's got a new series, Whiskey Cavalier, over on NBC that she's set to lead. That leaves Norman Reedus' Daryl Dixon to become the new lead. For his troubles, Reedus will receive a very big payday. The series also has a new showrunner in the form of Angela Kang, who had previously been a writer on the show. Scott M. Gimple, the previous showrunner, has been promoted to oversee the entire Walking Dead universe for AMC. His promotion implied that the network had intentions on expanding things even further down the line. So, even if the main series comes to an end, The Walking Dead can continue with further spin-offs and other shows. There is a large world to explore. It's just a matter of whether or not the audience grows tired of it or not. Ratings have dropped significantly over the course of the last two seasons. Still, other shows would kill for ratings half as good as what the show still manages to pull in. Fear the Walking Dead went through quite the creative shift recently as well, with a couple of core cast members leaving. With both shows making big changes, perhaps AMC can bring in some viewers they've lost recently. Or, at the very least, not suffer another ratings dip. Whatever the case, at the present time, they have no intention of ending The Walking Dead's brand of zombie action, at least not in the foreseeable future. The Walking Dead season 9 is set to premiere on Sunday, October 7. This news was previously reported by The Hollywood Reporter.